The new integrated results combine your organic and local rankings in a new Google algorithm intended to make finding businesses easier. A site which ranks well organically (below the map) has always had a better chance of ranking on the map. Those who weren’t strong organically could sneak on the map provided a low level of competition. This update hurts those businesses with strong local/maps presence and so-so organic presence. We do see, in some cases, that local prevails. A business with a strong local listing may be ranked within the organic results with just their listing data – not with any search specific information in the result. 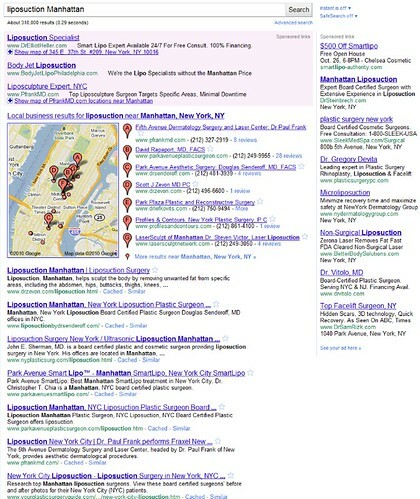 The good news is that clients with strong local presence might get pushed up in the results. The bad news is there is no search specific information in the result so click through might not be great. In the past businesses in suburbs who wanted to rank for “the big city” had a hard time getting on the map. This may continue to challenge suburban based businesses with this new Google update. Those with strong organic rankings who previously ranked organically for their targeted “big city” could count on traffic from the searchers who ignored the map and went straight to find what they wanted in organic rankings. This update, though, adds an additional factor to what Google considers relevant in regards to geography, which may pose a problem for suburban-located businesses. The new Google update stresses the importance of maintaining a strong presence in all aspects of the web. The new integrated results shows the importance of reviews, in particular on third party review sites such as Citysearch and Yelp by linking straight out to those sites from the main search engine results page. As seen in many of these screen shots shared above, If your Google Place page has pictures, your position on the search engine results pages will also be more prominent. There’s much more to be seen and discovered regarding this update. We look forward to working with our clients sites to be sure they maintain strong rankings. Nice summary and selection of screengrabs. I see a Yahoo! review indexed for the Parker Center For Plastic Surgery screenshot. Been looking for examples of that. Recall the location? 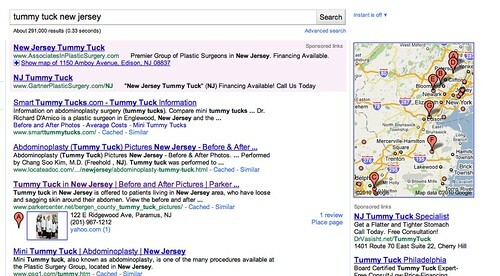 It’s “Tummy Tuck New Jersey”. Thanks Will. Have to admit I’ve never searched that term! What will be the implications on new websites going online…do they have a chance to rank on local/places? If so, is it just a matter of optimizing on the 20 factors or so, and comparing top local serps, and trying to out do them? 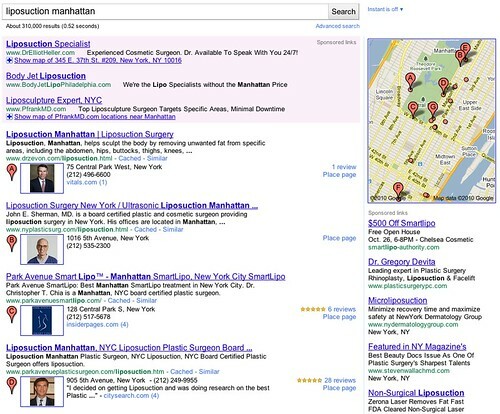 At this point it looks like strong local maps ranking plus strong organic listing is the big winner. It’s good news for most of our clients but we are seeing some where we will have to do some additional work to assure we stay on top. Since their changes we have lost 80% of our business. Not good at all! I for one find the new changes annoying. Previously I could quickly skip over the “local” results, but had the option to use them if I chose to do so. Now they take up 3/4 of the front page links! Truly annoying. I want to decide if I’m looking for a local business listed with an address; I don’t want google to do it for me.